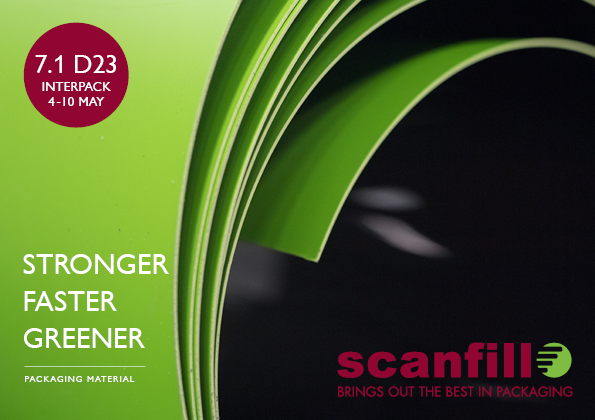 Obviously our subsidiary Scanfill AB will not miss out on participating on the world´s biggest packaging exhibition displaying the complete delivery chain. They will be exhibiting at Interpack in Düsseldorf from 4th to 10th of May. Welcome to visit them in hall 7 level 1 / Stand no. D23. They will focus on the classic SCANFILL material where 50 % of the polymer is replaced by mineral. The SCANFILL BIO material being based on the same concept but also being 100 % oil free will also have a given place in the stand. The materials are suitable for thermo forming, form blowing, film blowing and injection moulding processing. Scanfill AB will also inform about the most recent investments made ao about the recently increased production capacity. In addition the stand will mark the premiere of the new logotype and graphic profile of Scanfill AB.